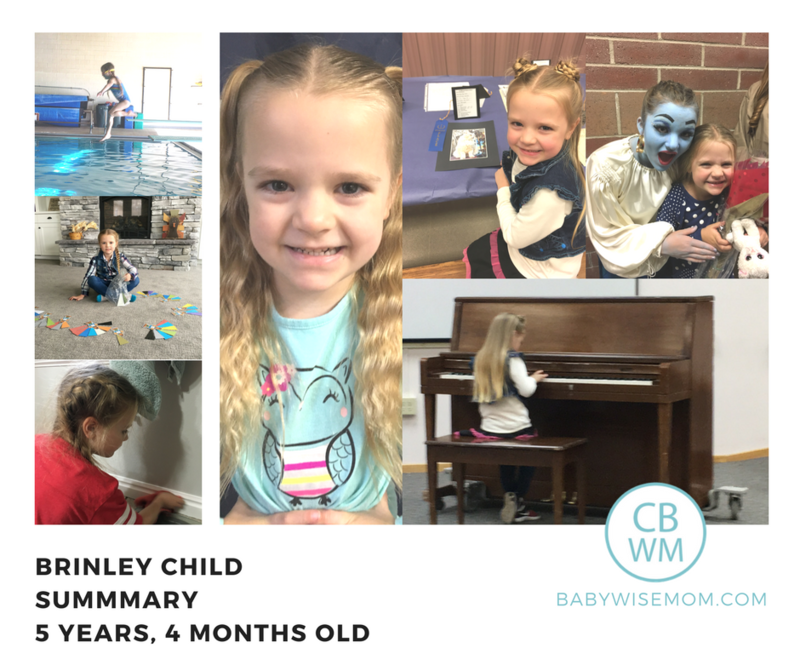 This is a summary for Brinley from 5 years 3 months and 5 years 4 months old. Sleep is great! I have to make sure that she gets in bed by 7:30, 8:00 at the latest. Otherwise she is super tired when it is time to get up in the morning. Getting to bed by 7:30 means she will usually wake up by 7 AM, where if she goes to bed after 8, she is usually still asleep when I get her up at 7:30, so the amount of sleep at night isn’t usually very different, but she is better rested in the morning by getting to bed earlier in the evening than later. Eating is great! She is enjoying prepping some of her food. She likes to prep her own sandwiches or toast. She is trying to be as independent as possible at lunch. Lunch is just Brinley and me, so we have simple lunches that she can help prep it. School is going great! She is doing very well and enjoying school. Last time I shared about how she had a hard time after I left the first time I helped in class. Since then, she has been great whenever I have helped. Swimming lessons: she is progressing, but she is funny. She will have days of no fear and then days when she is suddenly scared again. She has progressed to jumping off the diving board alone, so it is great! Gymnastics: she is still improving here and still terrified of the beam. She works to face that fear. I think her coach worries about it at times and probably worries that we as parents will be upset about her lack of progression and ability on the beam. Our perspective, however, is that we do not have any hopes or expectations for her to be a gymnast in life. This is just for fun and for me, her standing on the beam alone and trying to do some tricks is huge progress in facing her fears, so I call it a big win.Right now, she can do gymnastics and dance because they are during the school day and she is in Kindergarten, which is a half day. When she moves on to full day school next year, we may drop gymnastics just because I don’t see it being a long-term thing and it gets to be difficult to fit multiple activities in outside of school hours. Piano: Piano is going very well. She is learning to read notes quite well and is recognizing which note is where is on the staff. She is doing the Alfred series for young players, so they start just playing notes not on the staff. She has moved on to staff is and is quickly getting where each note is on the staff.